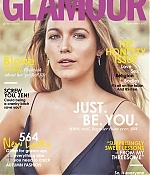 Blake candidly opening up about Ryan her other half – who she married in 2012 – as she talks to Glamour magazine that their friendship manage to the lay the foundations for a loving relationship and has been vital in overcoming conflict. And while a girl’s girl, she insisted that unlike previous romances she now goes to Ryan for advice and a shoulder to cry rather than her girlfriends. ‘Whereas with him (Ryan Reynolds), we were friends for two years before we were ever dating. And I treat him like my girlfriend. 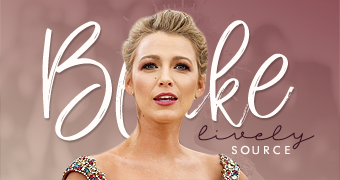 While gushing about their respect for one another, Blake gave fans of her husband’s Twitter account – which has amassed over 6.5million followers – some insight into the thought process behind his hilarious tweets that tend to focus on their daughters. The former Gossip Girl actress – who shares daughters James, two, and 10-month-old Ines with the Hollywood actor – admitted that he makes-up most of his ‘scenarios’ for comic value but it’s what she loves about him. Each year, Variety highlights five prominent women who are using their clout and influence to bring attention to worthy causes. This year’s honorees are: Jessica Chastain (Planned Parenthood), Chelsea Clinton (Alliance for a Healthier Generation), Gayle King (SEO Scholars), Blake Lively (Child Rescue Coalition), Audra McDonald (Covenant House), and Shari Redstone (Legal Services Corp.). Move over, Leighton Meester! Blake Lively has a new BFF on the Upper East Side: Anna Wintour, the notorious Vogue editor-in-chief who reportedly inspired the roman à clef The Devil Wears Prada! 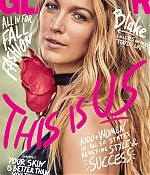 The 23-year-old Gossip Girl actress has appeared on the fashion mag’s cover twice in two years — opens up about her new friendship with the famed fashion editor in the October issue of Marie Claire UK. 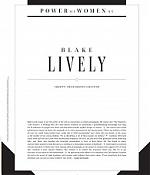 And Lively says she’s learned a lot from sitting front row at Paris Fashion Week with the 60-year-old editor. 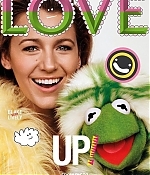 Though she’s happy to dish on her newfound friendship, Lively stays mum on her relationship with costar Penn Badgley, 23. 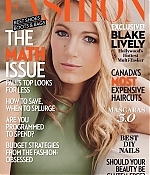 Blake is featured on the June 2010 cover of Vogue magazine! She is showcasing new swimsuits for summer and looks truly gorgeous in the mag. Check out the scans, photoshoot and caps from the behind the scenes video in the gallery. 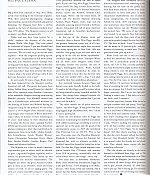 An excerpt from the article is already available here. I can’t quite recall the disquieting moment when I realized that they were, in fact, all around me. I knew that Cameron Diaz broke her nose doing it and was unsurprised to discover that Stefano Pilati is very, very good at it. I was amazed to hear that my friend Holly Peterson travels to the ends of the Earth in pursuit of it and that Cynthia Rowley fashions clothing expressly for it. I knew that Damien Hirst’s partner, Maia, is gaga for it but that he’d rather just watch, and I was frankly dumbfounded that both Barneys’ gnomish Simon Doonan and Vanity Fair‘s Falstaffian Graydon Carter each had a go—and with the same happy band of practitioners, no less. Instead of a Mason’s handshake or the furtive double glance of pre-Stonewall Temperamentals, an evangelical glint in the eye helped me recognize these cultists. Their faces would take on a beatific cast when I raised the subject, and in reverent tones they evoked otherworldly pleasures beyond the ken of ordinary mortals. And now I was about to be abducted into this bitchin’ netherworld of tubes, lips, and barrels. 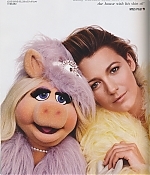 We now have scans from Blake’s feature in Esquire thanks to the fine folks over at Celebutopia! The most significant consequence of Gossip Girl may be the rise of its lead blond, who’s about to become a serious movie star. The guest on the late-night talk show crosses her long, bare legs. No one is looking at her. Her segment is done, and she has moved to the second couch, the one that’s hardly ever used. She’s alone. The host, he’s over with the guest who came on after her, the scrawny, aging heavy-metal drummer, and they’re rocking out with the house band, and all the cameras — there are so many cameras at these shows, way more than you’d think — have rolled over to the other side of the stage, and the audience, college kids and tourist couples hopped up on blinking APPLAUSE signs and instructions to be enthusiastic, is watching the host and the aging drummer as they goof around with a guitar. 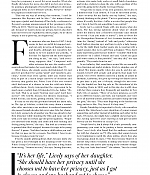 The up-and-coming actress, who has apparently decided to hang out after her interview and watch the rest of the show, sits on that other couch, clapping her hands — stiff palms and splinted fingers, like seal flippers — even though not one person, except for her publicist and her publicist’s subpublicists watching in the wings, is paying her any mind.